If you’re a homeowner or property manager who’s looking to harness Airbnb as a way to drive bookings, you’ll quickly realize that your Airbnb reviews are a valuable tool that will help you become more successful. It goes without saying that Airbnb hosts with more reviews and higher ratings on their listings page are more likely to attract new guests, enjoy strong visibility in search results, and earn Superhost status. This isn’t to mention that detailed guest feedback will help you improve your operations — whether it’s a 5-star review that encourages you to keep providing great hospitality experiences or a gentle reminder about what can be improved in your property, hosting process, or Airbnb listing. Need some help in managing your Airbnb reviews? Here’s a list of frequently asked questions that we’ve answered in order to help you develop a winning Airbnb reviews strategy. What sets Airbnb’s review program apart from that of other review platforms? According to research, reviews on Airbnb are generally more positive (higher ratings) than on sites like Yelp or TripAdvisor. Approximately 95 percent of short-term rentals on Airbnb have an overall rating that ranges from 4.5 to 5 stars. This could be due in large part to unique Airbnb’s review program, in which the provision of feedback is two-way and both guests and hosts can review each other. If you’re a host, you’ll notice that on most review platforms, you can only respond to reviews left by customers or guests; on Airbnb, you can actually write a review of your guest and have this displayed publicly. You have 14 days after checkout to review your guest, and the guest has the same timeframe to review their stay with you. Airbnb reviews remain confidential until both sides have posted or the review period has ended. Do I get notified of new reviews? 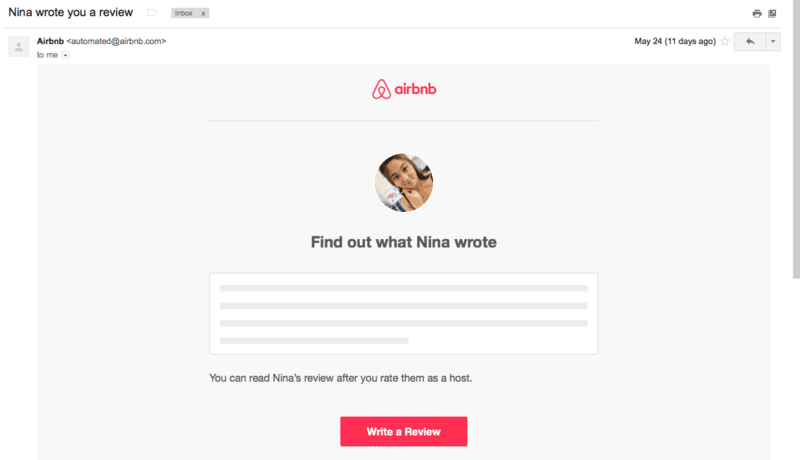 Airbnb sends email and app notifications whenever a host gets a new guest review. If you haven’t reviewed your guest, the notification will contain a link to a page where you can do so. After finally rating your guest as a host, you’ll receive a second notification and be able to read their review. Keep in mind that you have 14 days after the checkout to write a review. If you have already written a review of your guest, the notification will contain the full text of your guest’s new review, as well as a link to a page where you can respond to the guest. What kind of impact do reviews have on my listings and page on Airbnb? Reviews — specifically, your overall star rating (average rating across all your listings) — are one of the factors that Airbnb takes into account when determining whether or not you have earned Superhost status. Based on the latest updated criteria, hosts need to have an overall rating of 4.8 out of 5 stars in order to become a Superhost. Hosts must have no cancellations and should honor every reservation (unless there’s an extenuating circumstance). Can I respond to Airbnb reviews? Yes, you can respond to a guest review as soon as you have also written a review of your guest. Because reviews remain confidential until both sides have posted or the review period has ended, you can respond to the review only when you have rated your guest, or when 14 days since their checkout have elapsed. The simplest and easiest way to respond as a host to your Airbnb guest reviews is by navigating directly to your Airbnb Reviews page. You can also respond to a cancellation review: an automated review posted to your profile if you cancel a reservation as a host. Use this opportunity to write a public review response and clarify why you weren’t able to accommodate the guest. How can I leave a review of my guest? Writing Airbnb guest reviews is a crucial part of successfully managing your Airbnb listings. Apart from helping build a community of trust on Airbnb, your guest reviews will also serve as a way to foster stronger, more authentic connections with existing and potential guests. You can write up to 500 words in an Airbnb review that will be visible to everyone in the community. You can also leave private feedback, which is sent to the guest to show appreciation or suggest improvements on their next stay. Why is my overall rating not displaying on my listings page or profile? The most likely reason why you’re not seeing your overall rating on your Airbnb listings page or profile is because you don’t have enough reviews yet. Remember: you need to get at least three star ratings or reviews before your overall rating appears on your listing or profile. Any tips on how to generate more Airbnb reviews? Adjust your pricing. If you’re short on reviews, try temporarily lowering your nightly rate on Airbnb, or setting up special offers and discounts. This helps you establish trust in the Airbnb community, attract new guests, and deliver great value that can eventually lead to positive Airbnb host reviews and compelling social proof on your page. Use social media to promote your Airbnb listings. Social media channels like Facebook and Instagram are useful tools for raising awareness about your property on Airbnb. When posting content, use Airbnb-related hashtags and remember to share a link to your Airbnb listings page. Update your listing. On Airbnb it pays to provide the kind of information that guests typically look for. Apart from sharing info about your space, also strive for honesty and accuracy with your property descriptions and photos. This helps you set the right expectations and prevent guests from becoming frustrated with their actual stay. I love to use airbnb when I travel. It really gives you a local flare to the place you are visiting. When booking an airbnb I rely heavily on the user reviews since they are really the only way to tell if the place you are staying is as it is described. I think the idea of leaving guest reviews is great it really shows you appreciate the people staying with you and makes you more personable.